If enjoying your favorite froyo or caffeinated drink makes you shriek in pain, you might have sensitive teeth. When the enamel wears down, exposed areas on the surface of your teeth cause nerve irritation. You’ll notice the achiness when eating certain foods, flossing, or even exposing your teeth to cold air. 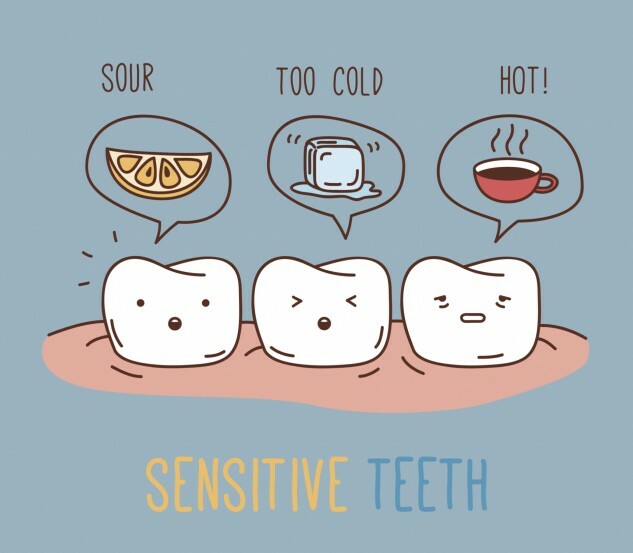 Tooth sensitivity is treatable and here are six ways to avoid the pain in the – you know – mouth. Switch to a toothpaste specifically designed to ease the discomfort in your mouth. Desensitizing pastes help calm the nerve endings in the pores of your pearly whites, blocking the pain signals. Whether your sensitivity is constant or occasional, using a sensitive formula daily will have you smiling in no time. Brushing regularly is a healthy habit, but brushing too hard can actually damage your chompers. If you’re scrubbing vigorously or using a hard-bristled brush, you’re probably wearing out the coating on your teeth. Instead, slow down and loosen the grip of your toothbrush. If necessary, try cleaning your teeth with the opposite hand. Pay attention to your teeth clenching habits. If you’re a tooth-grinder, the enamel of your teeth is breaking down. When you find yourself biting down hard, try to relax your jaws. Many people grind their teeth in their sleep and have no knowledge of it. To determine if you’re guilty, look for signs of facial muscle pain, tightness and stiffness in your shoulders, or earaches. Talk to your dentist about getting fitted for a mouth guard. Gum disease, poor dental hygiene and even brushing too hard can cause receding gums. When your gum tissue is worn away, the root of your teeth is exposed, causing you agony. It’s important to have regular checkups with your dentist to check for receding gums. If possible, your dental care provider may be able to rebuild your gums with a procedure using tissue grafts. When the pores of your teeth are open, acidic food will enter, sending chills down your spine. Steer clear of acidic foods in your diet such as carbonated drinks, citrus, tomato sauce or yogurt for example. If you suffer from sensitive teeth, whitening treatments can make the condition worse. Poor fitting gel trays put excess pressure on your gums and can even cause the whitening gel to ooze out, irritating your mouth. When whitening at home, opt to wear the trays for a shorter time or apply a gel with a lower concentration. Prior to each session, taking a NSAID medication may help reduce the soreness.